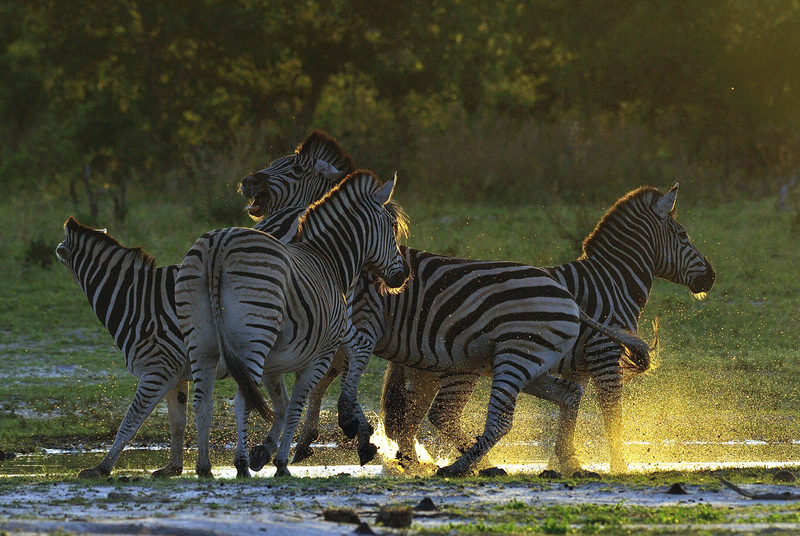 During February there were big herds of zebra, wildebeest and springbok, often grazing just in front of camp. Some of the zebra herds were 300 animals strong and they favoured the open pan which gave them good visibility against predators and nutritious grass to graze. One day we were lucky enough to see a zebra actually giving birth. It was amazing to see how the mares worked together to protect the new foal from the stallion who was keen to get closer. We were watching a tower of twenty one giraffe including five calves when we noticed that one of the giraffe had a broken horn which was hanging down at the side of its face, most likely as a result of fighting. Unlike European and North American deer species who drop their antlers annually, African antelope horns are permanent fixtures forming part of their skull so this injury was unusual and presumably very painful for the poor animal. Another time we were watching as fifteen giraffe were licking at the soil, a behaviour which helps them to ingest valuable minerals such as calcium and phosphorous. Elephants were still visiting the camp waterhole and it was lovely to watch them bathing and splashing from the main area. One time we came across a bull elephant and explained to the guests that they could tell he was in musth from the strong smelling urine that the animal was dribbling all over his back legs. The resident pride of six lions were seen drinking from the camp waterhole. In this group there were two adult females, one sub-adult female and three playful sub-adult males. The dominant males were not always with the pride, but we came across one of them sitting on a termite mound roaring. One day we found the pride had killed a wildebeest and were still feeding on the carcass, surrounded by black-backed jackals and vultures. The lions were also targeting the big zebra herds and we saw a zebra hobbling along with big claw marks as a result of a lucky escape. The resident male cheetah was seen a couple of times and a lone spotted hyena was seen occasionally, including drinking at the camp waterhole. Kwando guides enjoy showing guests all aspects of the ecosystems that they work in and one of the smaller, but no less interesting sightings included two tiny lizards of just five centimetres having a fight. Butterflies such as the brown-veined white and African monarch were seen settling in large numbers on fresh elephant dung where they were lapping up the moisture. Smaller mammals found included bat eared foxes, black-backed jackals, honey badgers and wild cats. White-backed and the scarcer white-headed vultures were seen bathing in one of the natural waterholes. Steppe buzzards, pale chanting goshawks, pallid harrier, yellow-billed kites and tawny eagles were amongst the raptor species identified. A secretary bird was seen chasing a mouse around until it caught and devoured it and we also watched a kori bustard killing and eating a small black mamba on the open plains. Brilliantly coloured blue-cheeked and swallow-tailed bee-eaters were located as well as three roller species (lilac-breasted, purple and European). A pride of ostrich was found dancing around in the pan, the adults were attempting to protect their chicks from jackal. It was also interesting to find a kori bustard displaying and inflating his neck pouch and fluffing up his feathers to attract females. The resident pack of six wild dogs were located near Halfway Pan and we were pleased to find that the alpha male and female were mating however in an interesting development of pack dynamics a few days later we noticed that the long-time alpha male was injured as if in a fight and the female was being mated by a different dog. Another pack entirely, one who had denned in the Kwando Reserve two years ago, was found after our sharp-eyed guide and tracker team had spotted kites and bateleurs at a distance. After following up they found the pack of ten dogs finishing up an impala who they had just killed. Let’s hope that they stay around for the next couple of months and choose to den nearby. In a spectacular sighting the two dominant male lions known as Old Gun and Sebastian taking down a male buffalo. The bull tried to stand his ground but the two big lions were too strong for him and Old Gun started to feed whilst Sebastian was still suffocating the prey animal. 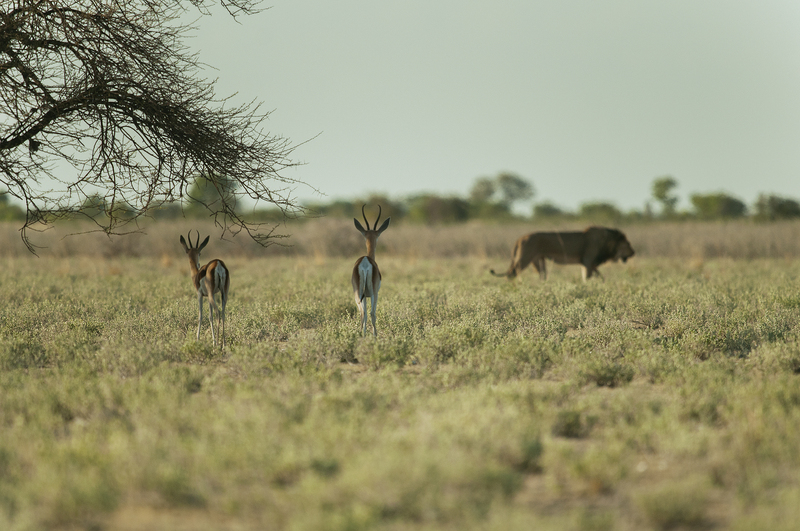 The two male lions stayed on the kill for a few days, irritably chasing away the jackals and vultures who came to feed. A pride of two adults and six cubs were tracked from camp until we found them. In the evening we returned and found the cubs by themselves whilst the adults had apparently gone off to find food. The next day we discovered that the hunting mission had been successful and the whole pride was busy feasting on a sub-adult giraffe. There were plenty of hyenas and jackals hanging around and by the next day the scavengers, including many vultures, had taken over the carcass. On another occasion we found the pride feeding on a freshly killed wildebeest. We also followed the lionesses as they tried their luck on some red lechwe, but their stalking was spoiled by the noisy alarm call of the francolins. We also saw a pride of ten lions being chased by a herd of elephants. Individual herds of elephants were seen heading towards the riverine areas and guests enjoyed watching them swimming and mud-bathing. However seeing so many elephants by the river was unusual for the time of year and an indication that the natural pans in the mopane woodlands did not have as much water as would be the norm during rainy season. However, some rains meant that the area was lovely and green meaning plenty of food for the herbivores. We found good herds of eland, impala, zebra, wildebeest, giraffe with plenty of young animals still nursing from their mothers. Warthogs and baboons helped to make up some classic African landscapes. The resident coalition of two cheetah brothers were seen rolling around in the ground seemingly to get rid of flies that were irritating them, but possibly to also scent mark their territory. We found them patrolling a couple of days later. The smaller animals also produced their share of the action and we saw a mongoose chasing and finally killing a lizard. We were lucky enough to find a serval fishing along the marsh and watched as it pulled out a catfish. Honey badgers were seen digging for mice and we saw one feeding on a monitor lizard. Hippos and crocodiles were seen at the larger pans and we also saw a big African python slithering up out of a waterhole. Bird sightings were good, especially around the Halfway Pan area which had many wetland species including storks, pelicans, egrets and terns. There was excellent general game around the inland pans including big herds of buffalo as well as zebra, giraffe, impala, tsessebe, sable and roan antelope. A magnificent herd of approximately 200 eland were found. These are the largest antelope species in the region with bulls standing to five to six feet tall at the shoulder (1.5-1.8 metres) and when massed together are a wonderful sight. One day we were investigating a burrow which showed some activity when we were startled by a warthog and four piglets who came bursting out and left the guides covered in a cloud of dust. Three sister lionesses with three cubs were located a few times. These lionesses were mostly seen in the southern part of the area where they were dominated by two big brothers. The cubs were of a very playful age, making for some good photo opportunities as they gambolled around. We saw the lionesses hunting zebra during night drive and were able to see them feeding on their kill the following day. One morning we found extremely fresh tracks of a lioness and cubs. We followed up and sensing that we were nearby positioned the vehicle up on a mound to get a vantage point. The slightest movement in the sage grass gave the cats’ position away and the guiding team were delighted to have found them. As we approached there was a huge roar and the pride moved in that direction until they were reunited with the big male. The cubs were keen to play with him, but he did not seem amused by their antics. The resident pack of wild dogs were successfully tracked and we followed them as they started hunting a herd of wildebeest, but then one dog disappeared behind a thicket and rounding the corner we saw an impala ewe fighting for its life as two dogs started to tear into it. Within ten minutes there was nothing left but bones. A couple of hyenas came to try and steal the carcass but the dogs ganged up on them and drove them away. Eventually the dogs lay down at the waterhole and relaxed. A male leopard was found a couple of times, but he is still quite shy and was darting from one bush to another. The brown hyenas were still regularly seen. By now they were occupying two dens and moving regularly between them. One morning we saw the cub’s eared pricked sharply forward and followed its gaze to see two lionesses resting nearby. As we approached the cats we saw that they were on a fresh wildebeest kill. The lionesses dragged the carcass towards the nearby bushes, probably to avoid the carcass being detected by aerial scavengers such as vultures which might in turn attract other predators. The brown hyena cub seemed tempted to approach the lionesses as he kept on going back and forth, but we breathed a sigh of relief when it eventually dashed into the den for safety. Elephants were seen often, including within the camp as they came to the river for water. Guests enjoyed watching them swimming and drinking from the camp and during the boat cruise. One herd was seen working together to surround and protect a day-old calf. Fruiting trees at the river attracted troops of entertaining baboons as well as birds such as green pigeons and Meyer’s parrots. Some guests commented on how much they enjoyed being lulled to sleep by the grunting of hippos in the river that flows part the bedrooms. We were able to spot animals such as porcupine, African wild cat and serval during night drive as well as different owl species ranging from the tiny scops owl to the huge Verreaux eagle owl. The mopane woodland was a birders paradise with species including broad-billed roller, European roller, golden oriole and Bradfield’s hornbill. Many bee-eater species (carmine, little and European) dominating the tree stumps in the open grasslands. A highlight for some guests was watching a hamerkop devouring a frog. 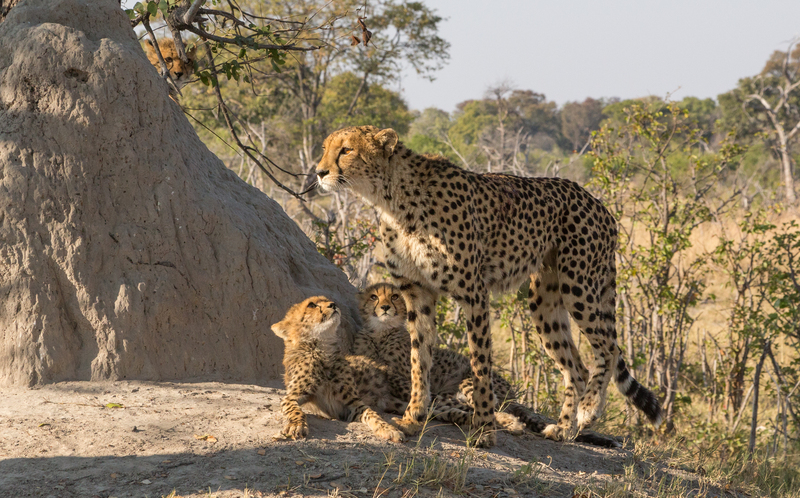 We were excited to find three new cheetah in the area, a female with her sub-adult cubs. The youngsters were apt to spend time chasing each other around whilst their mother was getting on with the serious business of hunting, moving from one vantage point to the next looking for their next meal. We saw these cheetahs bringing down and killing an impala, chasing away the jackals that were making a noise as the cats were trying to enjoy their feast. One day the resident male cheetah known as Mr Special was located marking his territory, but we were surprised to see him walk straight through one herd of impala after another without giving them a second glance. We wondered what he was up to but eventually we saw tracks of a female cheetah and her cub around Jackal Den area so we think he picked up their presence within the area. Towards the end of the month we saw Special pull off an amazing kill of an ostrich that he found walking along on the open plain. A pack of 13 wild dogs (five adults and eight pups) were located deep in the mopane at Lion Pan. These animals were highly mobile and seemed to be in hunting mood. They were following routes along old denning sites so we hope that they will stick around for the next couple of months until this season’s pups are born. We also picked up fresh tracks of a pack of nine dogs and managed to follow up and find them hunting until they brought down and ate an impala. Guest loved the whole tracking experience, especially as it culminated in such an exciting finish. A third pack comprising just four dogs were seen from camp whilst we were having our breakfast. We followed them hunting but they were not successful. The two resident lionesses of Splash pride and their six cubs were still in good condition but were staying more on the mopane woodland near to Kwara camp; it seems that they were still trying to avoid the new males on the Splash side of the reserve who would be a threat to their cubs. During the middle of the month these females looked nervous and were staying deep bushes with one lioness venturing out occasionally to look around. We suspected that the new males could have patrolled the area leaving their scent and we will have to hope that the mothers continue to do such a good job of hiding their cubs away. We saw that they had killed an adult kudu, so these lionesses are clearly good hunters. We also saw them near to New Bridge ambushing some red lechwe. Another time we watched them stalking a warthog, one of the lionesses edging along flat on her belly before springing for the kill. She was successful and soon two spotted hyenas, black-backed jackals and many vultures turned up to try and scavenge. To the west of Splash a fully-grown male leopard was located at Green pan with a fresh kill of a reedbuck ram. The kill was really heavy for the predator so he fed on the ground before dragging it up onto a tree. It is a good job that he did this because two male lions were couple of kilometres east of the area and raptors such as bateleur, tawny eagles and yellow billed kites were starting to give away the location of the carcass. A leopard was located a kilometre north of camp during morning game drive; the animal was identified as a young male. The animal was well fed, hardly surprising since there was plenty of prey in the area including lots of young antelopes. We watched two adult spotted hyenas nursing their four cubs at the den towards the Kwara camp side of the reserve. Closer to Splash there were many hyenas concentrated in an area where last year there was an active den so we are hoping that they might use the same spot again. There was plentiful general game including zebra, giraffe, wildebeest, reedbuck, tsessebe and impala. Guest enjoyed seeing big herds of elephant. Smaller mammals located included serval, aardwolf, genet, African wild cat and springhare. In a rare sighting, an aardvark was located during night drive on the way back to camp. There were lots of summer visitor birds still on Kwara Reserve including European bee- eaters, carmine bee-eaters, European rollers, woodland kingfishers and Wahlbergs eagles who we saw feeding on harvester termites. Marabou storks were plentiful since the breeding season was over for them. The heronry island was less active as most of the chicks had flown, but some birds continued to use the area as a roosting site. As the rainy season got under way the sweet grasses in the pan came to life creating a beautiful green landscape. 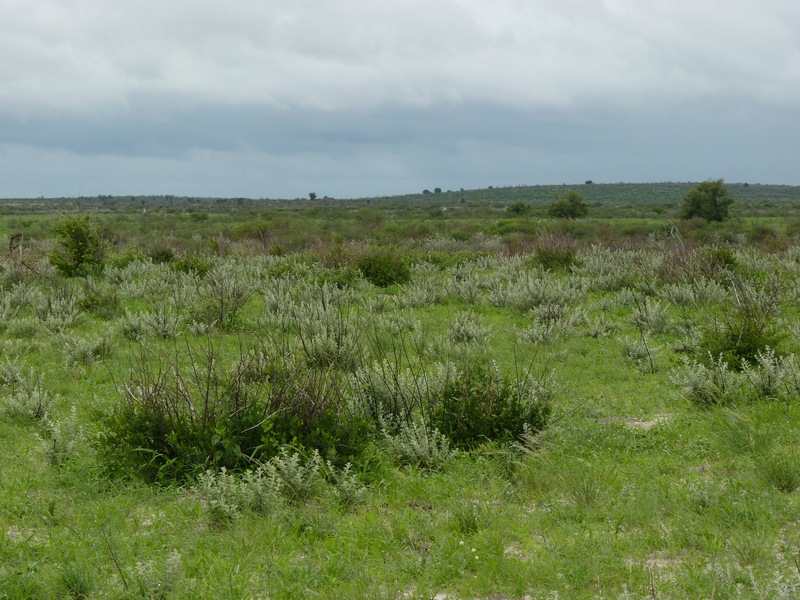 This nutritionally important grass is what attracts huge of zebra and wildebeest herds to the Nxai Pan National Park in an annual migration. As expected, the numbers of animals multiplied rapidly as the month progressed. We saw the resident pride of lions comprising two adult females, three sub-adult males and a sub-adult female. The cats appeared to be well-fed as you would expect during this time of plentiful game. One time they were hanging out in camp near to Room 1 and we watched them hunting zebra, but the prey species saw them in enough time and galloped away to safety. Another time the lions got luckier and killed a pregnant zebra close to camp. We saw the subadults on their own whilst their parents were away hunting. We watched them drinking and then one jumped up onto a termite mound posing beautifully for the cameras. That day they looked hungry, but we came across them the following day looking full-bellied and contented. We were pleased to find one of the lionesses who we had not seen for a while back in the area accompanied by three young cubs. The resident male cheetah was located a few times, always looking well-fed. 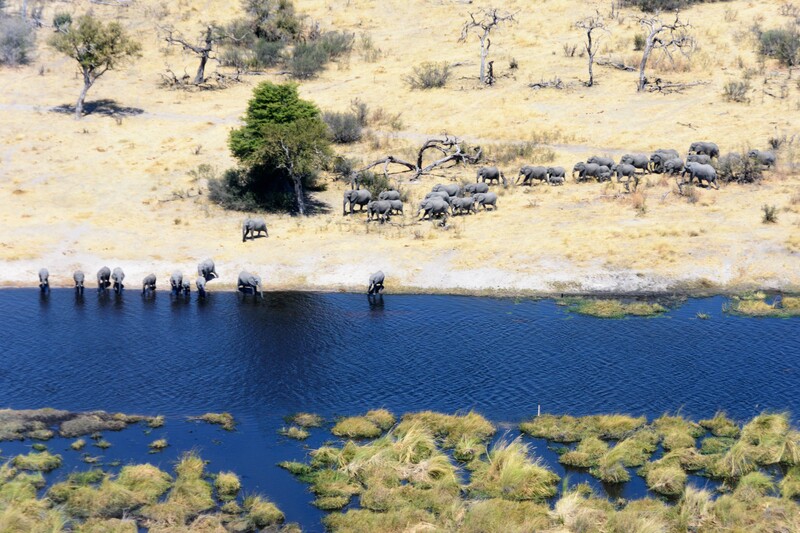 There were still elephants in the area and guests enjoyed watching them drinking and bathing at the waterhole outside the camp. Black-backed jackals were seen, often near to the lions where they were hoping to steal some scraps from their kills. One pair of jackals currently have six puppies aged approximately five months old. Guests enjoyed spending time dung beetles rolling their dung balls and African monarch butterflies getting moisture from the elephant dung. Kori bustards were spotted regularly and guests photographed male masked weaver birds building their intricate nests. Flocks of Abdim storks and black storks were seen hanging out close to camp. A pied avocet which is a rare bird to see in the region was located at the Department of Wildlife waterhole. Pale chanting goshawks were feeding on other birds such as Cape turtle doves and once on a black-winged pratincole (we saw up to 500 pratincoles in a single day). Other raptors included martial eagle, tawny eagles, steppe buzzard, pallid harrier, yellow-billed kites and greater kestrels. Different prides of ostrich were in the area, some with chicks. A mixed flock of white-backed and lappet-faced vultures were seen feeding on a zebra carcass. Wapuka Pride was located near to the airstrip with a blue wildebeest carcass. 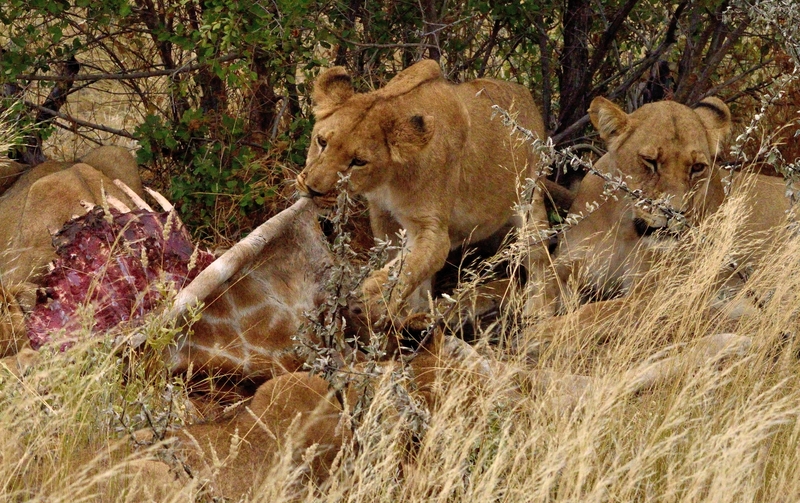 The following day we found the ten lions on a giraffe that they had managed to kill overnight. As we came in there were lots of scavengers around. The next morning the pride’s two dominant males had moved into the kill and one of the males was mating a lioness. Later in the month we watched two of the females hunting down a large warthog boar, but the prey managed to escape. We also came across the pride hunting red lechwe, again without success. Bonga Pride were also in the area, although they had pushed closer to the Lagoon side of the Kwando Reserve. We watched as they eyed up a herd of zebra, but chose not to make an attempt in the end. We saw them a couple of days later looking full-bellied and this time the five lionesses and three cubs were joined by the dominant males, Old Gun and Sebastian. The two male lions were seen patrolling and marking their territory by spraying urine on bushes. A pack of six wild dogs were located at Halfway Pan. They looked starving and we watched as they tried their luck but they didn’t catch anything. We were fortunate enough to locate a wild cat after picking up some guests from the airstrip. Although the animal was a bit shy it was a treat to see this species during the day. Black-backed jackals were observed sifting through elephant dung looking for beetles. One morning drive we managed to come across a coalition of four cheetahs who were trying to hunt wildebeest, but they were still skittish to the vehicles and ran away. A few days later we saw them feeding on a warthog and were able to watch them from a distance. The guides will need to work patiently get these new animals to our area used to the vehicles. Spotted hyenas were seen mobile, and one was running away holding onto a wildebeest skin. We also found a clan of eight in camp just as we were leaving for morning game drive. A black mamba snake was observed sunbathing on a termite mound. And in other reptile action, guests enjoyed the rather comical mating of two tortoises. We saw big herds of elephants coming through the area, moving from east to west as though they had a definite purpose in mind. Lots of general game was seen in the area, especially around Nare Pan. 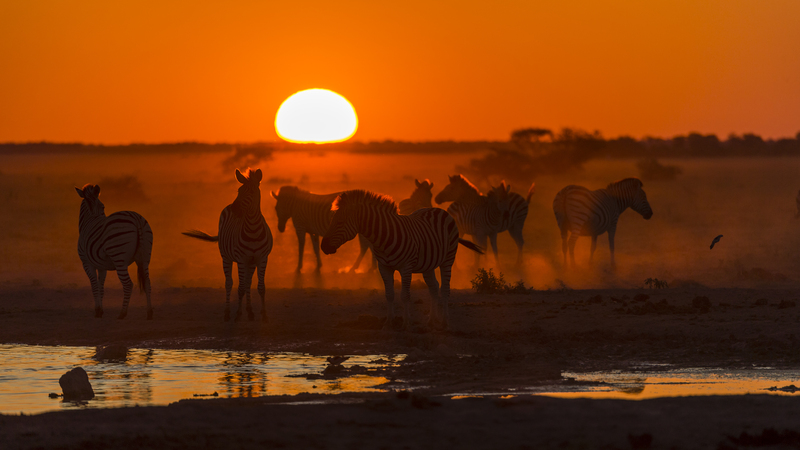 Species recorded included giraffe, zebra, impala, wildebeest, tsessebe and red lechwe. Many of the antelopes had new offspring with them. Birdlife was excellent, especially along the marsh. We saw three species of bee-eater (Little, Carmine and Blue-cheeked) as well as many different egrets and herons. Open-billed, saddle-billed and yellow-billed storks were all present. Raptors included tawny eagles, Wahlberg’s eagles and fish eagles. A special sighting was watching a martial eagle swooping down to take a banded mongoose, with the rest of the mongoose trying to rescue their family member. The two lionesses to the north of the reserve are known to the guides as Litikazi and Mma Mosetha. As they were patrolling they found a dead wildebeest on the runway which had been killed by hyenas the previous night. They moved on from the carcass and promptly despatched the calf who was still looking for its mother. A couple of days later they were seen hunting warthogs. Further south the Bonga Pride were pushing back into the Lagoon side of the Kwando Reserve after spending the last few months closer to Lebala camp. This pride comprises seven females and two dominant males. One of the lionesses has three cubs of 3-4 months old; we found them feeding on a zebra that appeared to have been killed the previous night. Sometimes she was accompanied by one of the males and at the same time the other male was mating a different lioness nearby. One of the cubs is not faring as well as the others and it was sometimes left behind. Two new very shy male lions were found hunting and patrolling at Kwena Lagoon. Males from the new coalition were seen at Zebra Pan looking very restless. The brown hyena den was still active and the cubs were seen playing nearby, but as the month progressed we noticed that they increasingly spent time away from the main den and moved to a new spot to the east of camp. They are now being seen less regularly and their behaviour is becoming more typical of the shy and elusive species. On several occasions we located solitary spotted hyenas mobile to and from a hippo carcass on a channel near to the army camp. A clan of four were also seen hunting. The resident pack of wild dogs were seen feeding on an impala. Last time we saw the pack they numbered seven so they appear to have lost a female. The dogs did not appear to be calling for her, so our guides deduced that she must have been missing for a while. The resident coalition of two male cheetahs was located and the animals looked well-fed. We watched them patrolling to the southern part of the Kwando Reserve. A shy male leopard was seen a couple of times near to Second Lagoon. 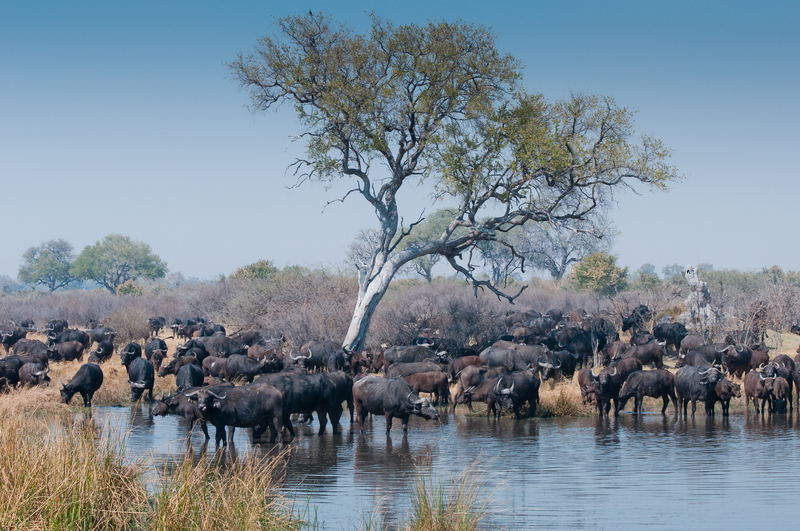 There was very good general game in the area with 12 buffalo bulls hanging out north of Second Lagoon. Several breeding herds of elephant were located drinking and mudbathing at waterholes that had trapped rainwater and also at the river in front of camp. Guests enjoyed the excitement of the young elephants as they rolled around in the mud. A huge herd of over 150 eland was grazing amongst zebra and wildebeest on the periphery of the mophane woodlands. Other antelope species seen included impala, tsessebe, red lechwe, common reedbuck, waterbuck, giraffe, roan and sable. Twelve kudu bulls made a magnificent sight, this being a larger than usual bachelor herd. Several troops of baboon were seen along the edge of the river and we watched as a male baboon flushed out a newborn reedbuck from its hiding spot chased it for a long distance. We were not able to see the end of the action, but the guides suspected that the baboon killed the young antelope in the end. Various families of bat-eared foxes with their young cubs of approximately six months old were seen. Other smaller mammals included different species of mongoose, jackals, servals, genets and African wild cats. Crocodiles and hippos were seen along the river and flood plains. Hippos had also moved into inland waterholes now that they have been filled with rainwater. There was a particularly bad-tempered hippo at Zebra Pan. Lots of vultures responded to a hippo carcass near to the army camp. All four species that we have resident in the area were seen, including the rare white-headed vulture. Raptors were seen feeding in large numbers on termites. We saw one feeding frenzy that included Wahlberg’s eagles, tawny eagles, kites, swallows and rollers. Other notable bird sightings included fish eagles, snake eagles, martial eagles, storks, cranes, hornbills and pelicans. Summer migrants such as swallows and bee-eaters were present. The sweet short grass that sprang up after December’s fire continued to bring in substantial herds of general game, especially zebra which were present in huge numbers. One time as soon as we left camp we picked up very fresh cheetah tracks and after following them for about 30 minutes we found the resident male cheetah known as Mr Special sitting up on a termite mound. Whilst watching we saw a dazzle of zebra approaching from the south. The cheetah got ready and when the herd was about 30 metres he burst forth to chase one of the foals out of the group. However the zebra stallion did his job well and was able to rescue the foal from the cat. After giving up the hunt Special started to mark his territory including climbing up and jumping on trees. During the month we saw the same cheetah also preying on impala and common reedbuck. One time we saw Special being chased by a lioness from the Mother Eye Pride. Initially it didn’t look like a serious situation for the cheetah, but when the lioness got close he burst into top speed to escape. The chase lasted about five minutes. For about 6 weeks we have been seeing three young cheetahs, two sisters and a brother. As yet these youngsters were still a bit shy so the guides are patiently working to slowly let them get used to the vehicles. A pack of nine wild dogs were seen often, one male of this pack was described as a “killing machine” by our guides and has been nicknamed Boko. When he is hunting the chances of seeing prey brought down is very high indeed. One time we were following for about 10 minutes when the chase started on a herd of impala with Boko in the lead. When we caught up with them Boko was fighting with a young ram. Immediately the rest of the pack arrived and disembowelled the antelope. On another occasion the wild dog pack started chasing a full grown common waterbuck. Boko as ever was leading and putting pressure on the antelope which ran into a small pool of water. The pack tried to harass their prey out of the water until eventually Boko leapt into the water and attacked the waterbuck from the tail whereupon the buck ran out of the pool. He was chased by the pack but he escaped and went back to the same water again. This time three dogs chased him into the water and attached him at the same time. The waterbuck decided to sit down in the water and defend himself with his large horns, but Boko was still holding onto the antelope’s tail until he managed to cut it off and ate it. By this stage both predator and prey were exhausted so everyone seemed to decide to take a rest and after about 10-15 minutes the dogs gave up and moved on leaving the tailless buck still in the water. Another time the pack killed an impala right inside camp near to Room 8. Because lions were not far away they picked up the distress call of the antelope and chased the dogs off the kill. The two male lions started fighting over the kill and they, together with two lionesses, spent the whole day in camp including lying right in front of the main area during brunch time. 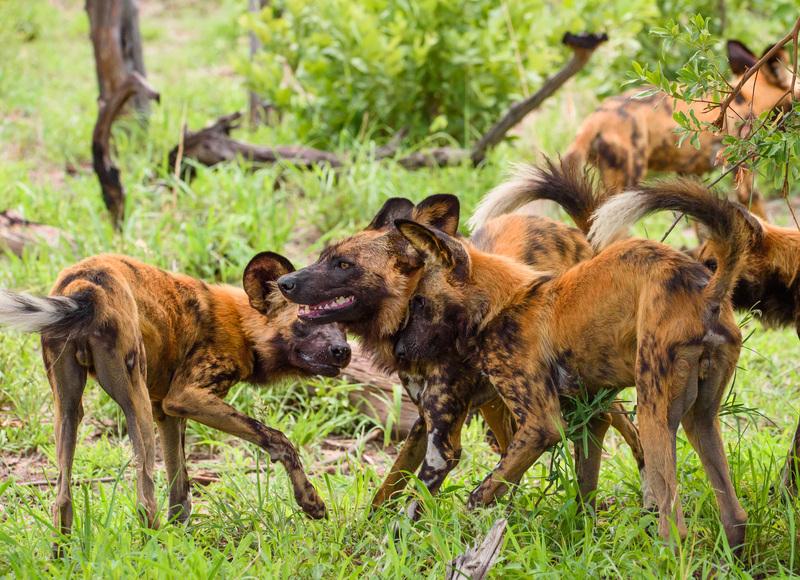 A different pack of four wild dogs – two adults and two youngsters – were also seen hunting through the mopane woodlands. The male lions known as “Big Man” and “Puffy” were located close to the boat station. We tracked them to find them posing beautifully on a termite mound. The Splash pride with their cubs were also successfully tracked. After being missing in action for a while the resident lioness known as Mma Leitlho was located south of Splash camp feeding on a warthog. Our guides were alerted to the kill by the presence of a tawny eagle and hooded vulture who had been sitting in a branch above the carcass for a while. Once she started moving our guides noticed that she was lactating, so we suspected she had cubs hidden nearby. Whilst we were enjoying bush dinner we heard two male lions roaring about a kilometre east of camp. Ten minutes later we saw a lioness followed by two males walk between the main area and where we were sitting. The lions and the guests all remained calm and the guests even managed to get some photos to record this extraordinary moment. There was an active spotted hyena den near to Kwara camp. We saw three adults and four cubs. The cubs were of a playful age and were coming over inquisitively to the vehicles, to the delight of the guests. Termites flying out after the first rains made a feast for other species including giant bullfrogs, snakes, mongoose and many species of birds such as eagles, bee-eaters and swallows. We saw African rock pythons as well as tortoises. There was very good birdlife in the area and we saw wattled cranes, secretary birds and southern ground hornbills almost every day.